How would you improve upon our product/ services? Let's assume, that your company is launching a new products and they want you to improve the products and the standard of their company. Now, you must be able to collect the whole ideas by understanding why the company is in the particular business, what do they do and why would a customer rely on them for their products and services. So, you need to be able to answer this particular question with confidence and focus. This question directly depicts your quick decision making skills to the interviewer, which gives you an extra chance of getting hired. So, what do you do? How can you prove that you have great ideas—without straight up bashing what the company is already doing? Check out the following tips to ensure you cover all the points in your interviewing process. - Do not explain about the products you have never used before. 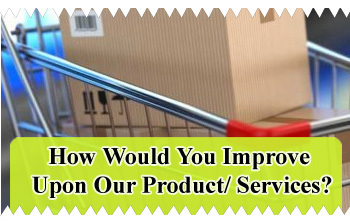 - If you are unsure about their products and services, try to throw back the question to them. The question should be somewhat like, who the product might be used by, what is the products about, etc. Then provide with some productive suggestions. - An Orientation towards the product in meeting its original goal. - Identify their customer base and their use cases..
- Do not make any negative comments about their products, unless you have better ideas to improve..
- Spend time on their user forums or other site where you might figure out what their users want. .
- Make sure that product and service improvements match the use cases that you’ve listed and don’t be afraid to ask your interviewer if you are on the right track or if they prefer you to focus on one or two of your ideas. - Don't be afraid of volunteering constructive ideas. - Identify these gaps. where the existing product fails to meet the needs of your use cases. Who the users are, and are they the same as the customers or different? Why these users/customers want to solve this problem? What is their underlying motivation or need? What use cases do you want to solve for? Why and for whom you’re solving it? What your goals in solving this? Answer : Since I have already worked closely with the development team I understand how to carry out the research for development of product and services, then analyze the customer requirements which will help in improving the things and making the products & company better. Initially I will try to create a solid understanding about the product reviews their consumption habits and the technical possibilities for improving existing products at the entire market through the lens of your customer to determine the actual potential, then check out the related products' features that the competitors offer. Once I finish gathering all the information on market trends, the next step will be to analyze the segments that the product is highly demanded as predict future buying habits as much as possible. Eventually the last step will be product promotion, placing marketing experts for reaching customers, and determining what funds are available from finance and management departments.